When Michael Rubin was 16, he built a 142-foot ski ramp made out of 45,000 pounds of ice so customers at his ski shop could test their gear. In August. In 98 degree weather. For Rubin, that appetite for risk has paid off. He is now 41 years old and worth $2.7 billion. Impressive, especially when you consider that he was once bankrupt. When Rubin was 8 years old, he was already an entrepreneur. He sold vegetable seeds door to door in his Philadelphia neighborhood, had a gaggle of kids shoveling snow out of driveways and printed stationery on an Apple II plus and sold it door to door. By the time he was 12, Rubin had set up a ski tune-up shop in his parent’s basement and by the time he was 14, Rubin opened a retail ski shop. “That’s when people said, ‘Wow, he is really into business.’ But for me, it always felt normal,” Rubin told Entrepreneur.com when he sat down in the New York City offices of one of his multiple e-commerce businesses, a fashion flash sale site, Rue La La. Before he was old enough to drive, Rubin bought a Porsche. He did not tell his parents about his plans until after he had acquired the automobile. His mother, a psychiatrist, was quite alarmed to hear of Rubin’s purchase. “She was not happy, she was definitely not very happy,” says Rubin. Rubin graduated from high school, but he was able to leave campus at 11 a.m. each day, flexibility which allowed him to simultaneously run his retail ski shops. Rubin enrolled in Villanova, where, he says, he had every intention of graduating. It was doomed from the start. He was always bouncing back and forth between buying and selling closeout lots of ski equipment and shoes and school. 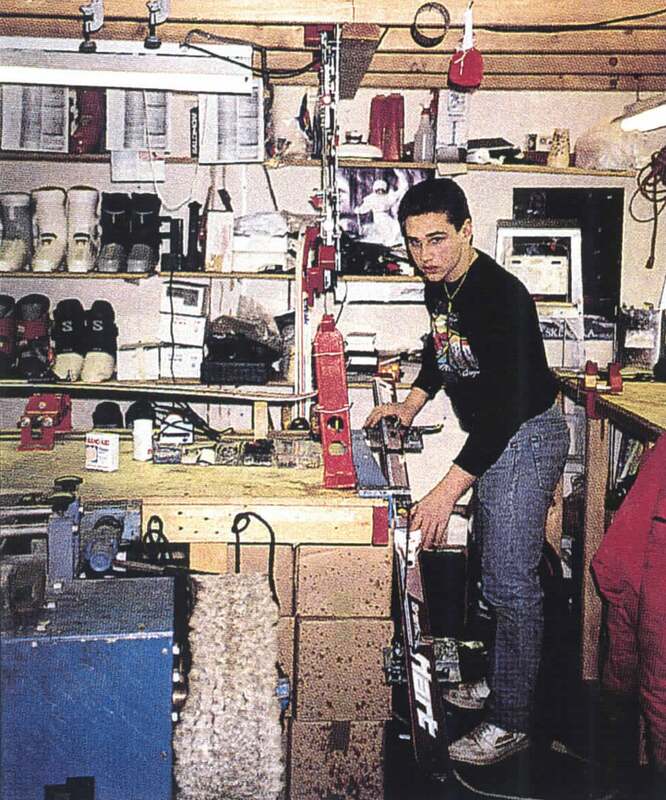 Rubin in his ski-repair shop as a teenager. Rubin dropped out of college after six weeks. His parents were a bit dismayed, but not surprised. “I was so anxious about advancing my business aspirations, it just was what it was. There was no stopping the freight train that was going in that direction,” says Rubin. If he could go back, Rubin says he would have stayed in school. Perhaps even attended business school. At 41, Rubin can see that starting his career in his mid-20s would have been perfectly sufficient. And he might have learned a thing or two by staying in school. But at the time, says Rubin, his youthful, ambitious drive would pause for nothing. Right now, Rubin is exclusively building e-commerce businesses. But it wasn’t always that way. And his move into e-commerce was against his initial instincts. The discount ski-equipment business that Rubin built, KPR sports, merged with then publicly traded athletic shoe company Ryka to form Global Sports Inc. (later to be known as GSI Commerce). By 1998, when Rubin was only 26, GSI was bringing in sales of more than $130 million a year. In that year, the only analyst covering his publicly-traded company called him and asked Rubin how he was going to integrate the Internet into his business model. “‘Hey Michael, what are you doing about this Internet thing?’ I said, ‘What do you mean?’ And he says, ‘Well, there is so much interest in the Internet.’ And I am like, ‘Oh, don’t waste my time. It’s all these young kids who lose lots of money. They barely do any revenue and the only thing they are good at is losing money. Don’t waste my time with this Internet thing. I have no interest.’ And I hung up on him,” says Rubin. Michael Conn, now the CFO of Rubin’s business holding company Kynetic, called Rubin back five minutes later, prodding an already aggravated Rubin yet again to pay attention to this new phenomenon, the Internet. “I said, ‘I have no interest in this, what are you bothering me for?’ and I hung up the phone. And I started thinking about it,” says Rubin. Rubin called the CEOs of the chain stores that he was selling to, including Modell’s and the Sports Authority, and he realized that while they all were feeling pressure from their boards to do something to bring their businesses online, but nobody was sure how exactly to do it. This spelled opportunity for Rubin. 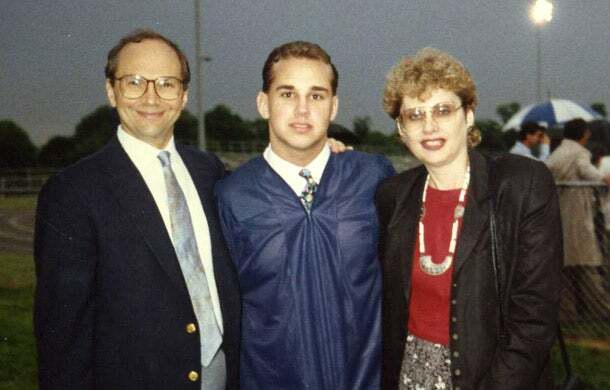 Rubin with his parents at his high school graduation. In 1999, Rubin started to develop ways to move GSI online. The wholesale sports equipment retailer, even before moving online, never had any physical retail stores – it had sold directly to other retailers. EBay bought Rubin’s business in 2011 for $2.4 billion. At the time, Rubin owned just shy of 10 percent of the company. Today, Rubin’s three e-commerce businesses within his holding company Kynetic are the sole focus of this billionaire entrepreneur. Online sports gear site Fanatics did $800 million in revenue last year and was recently valued at $3.1 billion. Internet fashion flash sale site Rue La La had sales of nearly $400 million in 2012 and two-day shipping membership site Shop Runner has been valued at approximately $600 million. Just this fall, Shop Runner received a $200 million investment from Chinese e-commerce giant Alibaba. The cash infusion will help Shop Runner grow, but also gives the new e-commerce platform a level of sophistication and maturity for having the backing of such a global juggernaut. Rubin is an aggressive and active businessman who wakes up a couple hours after going to sleep to send emails about the ideas he has had. Despite his racing thoughts, Rubin is laser focused on growing his three businesses. And he is confident that e-commerce is a young and growing industry. For the foreseeable future, Rubin expects the e-commerce to maintain double-digit growth. Part of that growth, says Rubin, is the ever-increasing popularity of mobile devices. “Mobile is going to change e-commerce as much as e-commerce has changed brick and mortar retailers,” says Rubin. Fanatics gets 45 percent of its traffic from mobile today and three years ago “virtually nothing” came from mobile, Rubin says. Where Fanatics is currently a $1 billion a year company, Rubin expects it to grow into a $5 to $10 billion business before the end of the decade. Correction: An earlier version of this article misstated Fanatics' traffic growth as sales growth.